Since the British government has triggered Art. 50 TEU it can be considered a certainty that the United Kingdom will leave the European Union. What is not clear to date are the exact terms that will shape the future relationship between the two parties – and thus the situation of British stakeholders in the European market. This blog post aims to provide an overview of the possible consequences British copyright stakeholders may face in the German market following Brexit. Given the current state of negotiations, the ongoing debate within the UK government and insuperable problems such as the Irish border, the possibility of a so-called hard Brexit or no deal scenario is still far from unlikely. This blog will start by showing what is to be expected in this scenario. Thereafter, the event of a CETA-like treaty as well as a potential EEA accession of the UK will be discussed. The consequences in the case of a hard Brexit scenario would be significant. The current, and relatively high, level of EU integration and harmonisation in the field of IP and copyright would cease. In particular, the many international conventions in the field of IP and copyright will only function as a safety net to a very limited extent. Only authors, performing artists, phonogram producers and broadcasters will be able to claim national treatment according to the various applicable conventions. In the absence of a foreign rights regime for publishers, British publishers will also be treated like their German counterparts. In contrast, Lichtbildner (photographers of works that are not protected by copyright in the strict sense of the word), event organisers, film producers, database producers and creators of scientific editions will only be protected if one of the narrow provisions of sections 124 et seq. of the German Copyright Act (UrhG) apply. With regard to database producers especially this will rarely be the case as sect. 127a UrhG in relation to third countries only provides for one instance in which protection exists. This would require a European legal entity to be operating from the UK. The most-favoured-nation (MFN) principle of Article 4 TRIPs will not help to remedy the loss of protection for any of the aforementioned rights. In particular, British stakeholders will not be able to demand EU citizen treatment on this basis. Employment of the MFN principle in conjunction with CETA or the free trade agreements with Singapore or South Korea would not be of help because those agreements do not provide for any individual rights exceeding the standards that are already provided in Germany. Many forms of exploitation and utilisation of rights in Germany that are currently allowed under EU (exemption) rules would, in the case of a hard Brexit, require licensing in Germany in order to be allowed in the future. Most prominently, rights to goods that are put on the market in the UK will no longer be exhausted in the EU and thus in Germany. Therefore, distribution of such goods in Germany will require the consent of the right holder. British broadcasters would no longer be able to benefit from the legal fiction enshrined in section 20a para. 2 UrhG according to which licences only need to be obtained for the country in which the broadcasting took place (i.e. the UK), even though the broadcasts are available in another EU country (i.e. Germany). In future, British broadcasters would need to obtain licences for every single EU country they are broadcasting to. Unlike now, content providers would not be allowed to provide content that is only licensed for the UK to their British subscribers when those are on the continent, as provided for in Article 4 Portability Regulation (2017/1128/EU). Currently, German collecting societies may be obliged to represent their British counterparts in Germany for purposes of online music distribution according to Section 69 para. 1, in conjunction with section 59 para. 3 UrhG. This would no longer be the case. The same would apply to works that have been created according to UK Marrakesh provisions that may currently be used according to Article 4 Marrakesh Treaty Regulation (2017/1564/EU). There is no general rule on how clauses in existing licence treaties that define the licence territory as territory of the EU will be treated post Brexit. It will be a matter of construction whether UK territory will be considered to be included in such clauses. To that extent one will, inter alia, need to determine whether, for the parties involved, it was foreseeable that Britain would ever leave the EU. One could argue that the older the treaty, the more likely it is that a court will judge that the UK will still be included in such a clause. 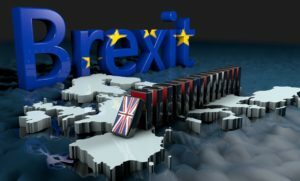 The question of whether such a clause may be adjusted or cancelled unilaterally depends on whether Brexit can be considered a frustration of contract within the meaning of Section 313 German Civil Code (BGB). This will likely be the subject of many court decisions in the near future. Depending on the production scheme and organisation, British film productions may no longer be considered European productions with regard to broadcasting quotas. Many German and European statutes only apply to natural or legal persons from an EU/EEA member state. Thus, the question arises how matters will be handled where this prerequisite was fulfilled before Brexit but is not anymore thereafter. With regard to property rights, the answer is that they will remain valid if they came into existence before Brexit. In contrast, uses that were legal according to EU exemption clauses will become illegal with immediate effect. British rights to titles would no longer be enforceable under the simplified model of the Brussels-1a-Regulation. Rather, a complicated and lengthy exequatur procedure will need to be observed. A CETA scenario would not deliver any different results regarding the topics discussed above. In contrast, an EEA-accession would prevent most of the negative consequences – with the exception of two aspects. Firstly, the Brussels-1a-Regulation is not incorporated into the EEA acquis, so the enforcement problem would not be avoided by accessing the EEA. Rather, the UK would also need to access the Lugano-2007 agreement which is not part of the EEA acquis either but, inter alia, governs enforcement between all EEA member states and some other states. Even this would, however, only partially avoid the enforcement obstacles that a hard Brexit would create. Secondly, the Marrakesh Treaty Directive has not yet been transposed into EEA law. Therefore, the fate of Marrakesh works cannot yet be foreseen for this scenario. The hopes that international conventions or a CETA-like future agreement would lessen the negative effects of Brexit have proven to be unjustified. Given the current likelihood of a hard Brexit, British stakeholders are therefore urgently advised to check their treaties and business models for risks and obtain licences where necessary. Potential future rightholders should consider founding EU legal entities that would be able to attain rights and administer them on their behalf. British film producers should be looking at restructuring their organisation in a way that would qualify their films as EU productions within the meaning of the Audiovisual Media Services Directive (2010/13/EU).